When asked by the organising committee to drop off some of our 2017 Progeny Shiraz for the awards ceremony for the 2018 Saint Martin Heathcote Wine Show you suspect the wine has done well however we never in our wildest dreams thought we would walk away with 4 trophies. Last Saturday winemakers and Heathcote enthusiasts gathered in the newly built Barracks reserve in Heathcote to celebrate the regions winemakers. Over 267 Heathcote wines were judged by a panel of industry experts led by Sue Bell (Chairing Judge) the preceeding two days. A total of 26 gold medals , 40 silver medals and 88 bronze medals were awarded plus 14 trophies of which Sanguine Estate claimed a total of 4 for the 2017 Progeny Shiraz. 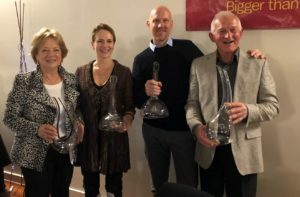 We are also thrilled that She-Oak Hill won a trophy for their 2012 She-Oak Hill Shiraz just adding a little more kudos to Mark who is also She-Oak’s winemaker. Well done Mark on yet another incredible achievement!